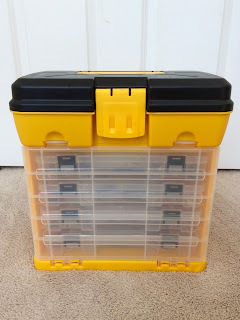 Atlantic Salmon Flies: Product Review: Harbor Freight Toolbox Organizer...Tackle Box...Fly Box? Product Review: Harbor Freight Toolbox Organizer...Tackle Box...Fly Box? It's no cedar chest, but it gets the job done. About 15 years ago, I bought a plastic Black and Decker rolling toolbox from a discount store. I thought I could use it to carry my drum set hardware. When I got home, I was surprised to find a soft sided tool bag inside. The rolling toolbox wound up being too small for the hardware, but the bag looked useful for other purposes. The bag had a rigid bottom and was the size of a piece of carry-on luggage. It was black with orange accents and had little strips of reflective material sewn into its sides. Because the bottom was rigid, folded clothes could be transported without getting too wrinkled. It had several compartments and zippered pockets. They were the perfect place to keep a cellphone charger, business card holder, pair of headphones, etc. To my wife's dismay, this bag became my preferred carry-on/overnight bag. It wasn't the most handsome bag, but it worked really well. I remember checking into the Hanover Inn, in Hanover, New Hampshire, with my favorite bag slung over my left shoulder. My wife looked at me, rolled her eyes, and said something along the lines of, "You know, you look like a real cafone carrying around clothes in your Black and Decker 'luggage.' " She had a point. Soon after, I bought a more appropriate carry-on bag. My trusty Black and Decker bag became my travel fly tying kit bag. As a tying tool and material bag, it works at least as well as it did as an overnight bag. Each tray can hold an awful lot of flies. Most fly tyers are aware that the craft store can provide access to a wealth of tying materials at a fraction of the cost of a fly shop. As a tube fly tyer, I've found local art supply stores and hobby shops to be just as valuable. When it comes to repurposing items for fly fishing or tying, my new favorite store is Harbor Freight Tools. For a fly fisherman, Harbor Freight can offer solutions to problems we're not aware we have. If I have enough time, I slowly walk the aisles and scrutinize anything that looks like it might be remotely useful. Last year, I bought an inexpensive heat gun which I use to weld loops in fly lines. Around the same time, I bought a small metal bowl with a large, round magnet glued to the bottom. It is perfect for holding hooks. If the bowl gets knocked off the desk, the hooks don't go all over the floor. I had some time to kill the other night, so I stopped at Harbor Freight on my way to work. After staring at the tool boxes for an unusually long time, I grabbed the one pictured here. I have been looking for a good way to store lots of salmon flies in one place, but hadn't considered this option before. 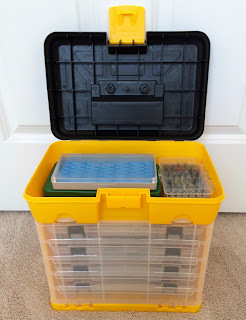 Prior to buying this toolbox, I kept summer flies, fall flies, and tube flies in separate plastic boxes. I would have to do a little reorganization to make it work in this box. I deiced to buy it. There is ample room above for extra fly boxes and supplies. My spare tube flies fit in one plastic insert. My fall flies fit into another. My spring and summer flies occupy most of two boxes, with dry flies taking up the remaining space. The top compartment is large enough to hold several fly boxes. I don't carry every single fly box on me at once, but I do like to have some stocked boxes ready to go. I have small box with flies tied on double hooks in sizes 8-12. I have a similar box with size 10-12 single hook flies, as well as one for Buck Bugs and Butterflies. I have a box with flies tied on large double hooks, sizes 2-3/0. 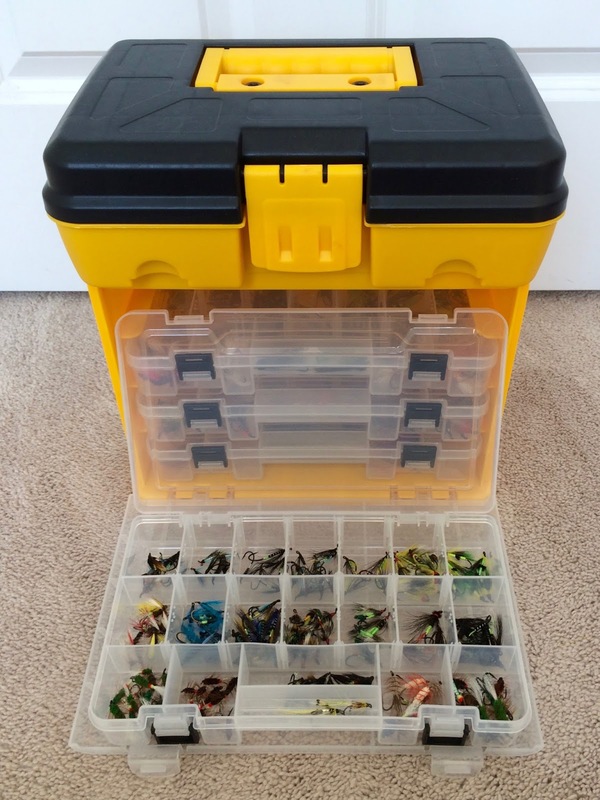 There is a large compartment box for dry flies. I have a Finsport fly wallet full of tube flies, but I typically carry only one of its loose inserts on me at any given time. 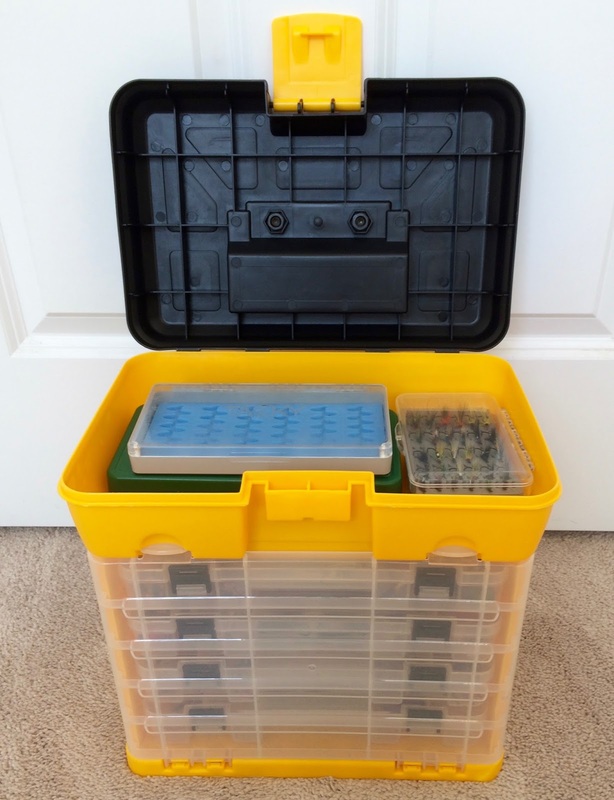 I have two small compartment boxes, one with single tube fly hooks and one with double tube fly hooks. I don't need access to all of these boxes at one time, so I am going to store many as possible in the upper compartment of the toolbox. I plan on leaving this fly box in the car during salmon season and while on trips. If I need specialty flies, all I have to do is swap boxes or grab some from one of the plastic trays. Eventually, it occurred to me that I had bought a stripped down tackle box. That's pretty much what tackle boxes are now, right? All I'm missing is a little rack on which to store my spinnerbaits. It's ok. I'm not pretentious. If I carried my clothes around the Dartmouth College campus in a Black and Decker tool bag, my spare Jock Scotts and Silver Doctors can live with being housed in a discount toolbox organizer. I have something really similar to store my backup flies at home. It works really well. I use a home-depot-bought plastic Stanley tool box as my traveling fly tying kit. Classy, not so much. Functional and light? Absolutely. Good post, Ben! Thanks, Gary! At least you don't get your luggage at Home Depot!